In the heart of the northern Italian Dolomites, close to the border with Austria and dominated by the famous Tre Cime (Three Peaks), is the beautiful Tyrolean village of Dobbiaco. A week's self guided walking in the Dolomites allows you to discover the beauty and sheer magnificence of the majestic Alta Pusteria Valley. With over 1,000kms of trails, the Italian Dolomites are a mecca for high-level walkers and we provide a selection of meticulously researched route notes for walks at various levels. highlights include a high ridge path along the Austrian border with 360-degree views over the Italian Dolomites and Austrian Alps, and a circular hike around the world-famous Tre Cime, three immense obelisks of sheer rock that have now become the symbol of the region. Amazingly, all of this is accessible on well-defined paths either directly from the hotel, or via a short bus or cable car ride. 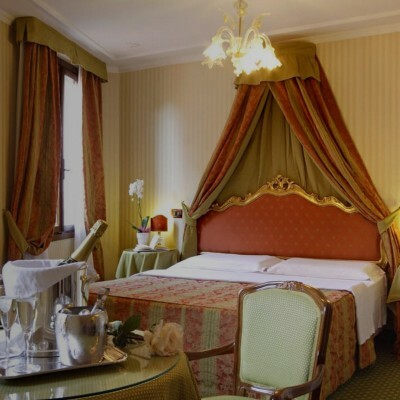 The superb walking is matched by first-class accommodation at the beautiful **** Park Hotel Bellevue, which combines old-world charm with good old fashioned hospitality. Facilities include a luxurious spa with sauna, steam room, swimming pool and massage/beauty treatments. There's also a cosy lounge to curl up in with a book, or you can take an aperitivo in the relaxing bar. Evening meals are served in the atmospheric dining room where the menu includes a weekly five-course banquet and themed Tyrolean buffet evening. Superbly varied and well-signposted footpaths and forest trails, both at high altitude and in the lower valleys. There are moderate ascents on most days, and longish descents on days when a cable car is used to gain altitude. Walkers should have a good fitness level and be confident on uneven terrain - a couple of the suggested walks may be unsuitable if you have a fear of heights, however lots of other options are possible. In the unlikely event of extreme bad weather, cable cars may not operate. Walking boots are essential and walking poles are recommended. Some of the higher level walks may have snow in early/late season. Arrive at your hotel in Dobbiaco. From the hotel, you ascend gently along peaceful country lanes, through picture-perfect Tyrolean villages and hamlets dotted across the hillside - each boasting a lovely chapel or church offering stunning views and decorated with frescoes. At Stadlern, take time over a picnic to soak up the mountain panorama before returning to Dobbiaco alongside the bubbling Rienza River. There's a short bus ride before a spectacular gondola ride this morning to the high Rotwand pastures (1,914m), just below the mighty Croda Rossa limestone peaks. From here it's a gentle descent along pretty pine-scented forest trails to the ancient Kreuzbergpass, south Tyrol's most easterly mountain pass. You then head up to the refuge of Malga Nemes, a fabulous panoramic spot for lunch, with marmots foraging in the open sunny pastures, before descending along a wide woodland track to the Tyrolean village of Moos where you pick up the bus back to Dobbiaco. Enjoy truly spectacular scenery on one of our favourite trails in the Dolomites. It's a fantastic full-day hike with ascents and descents of around 800m for unrivalled views. First an easy stroll along the shores of the turquoise Lago di Braies and then ascend via the Alte Kaser pastures to the idyllic mountain bowl of Hochalm for lunch. Your descent is through a deeply carved valley below colossal peaks and impressively striated cliffs. Today you'll head into the heart of the Ampezzo National Park in the italian-speaking Veneto region. Setting off from Cimabanche along a disused railway line, you'll head up through the Gotres Valley on an old military road to reach the high mountain pasture of Forcella Lerosa. You descend to the idyllic meadows of Rifugio Ra Stua and follow a narrow forest footpath towards Cortina d'Ampezzo. This fabulous walk takes you along the impressive crest of the Carniche Alps. You start the day with a bus then cable car ascent (payable locally) up towards Mount Elmo (2,041m). From there, an old military supply route takes you to the refuge Sillianer Hutte (in Austria). This ridge forms a border between Italy and Austria and gives you spectacular views across the Austrian Alps. Your descent is on a less well defined rocky path that crosses the pretty mountain pastures of the Klammbachalm to arrive at the picturesque Klammbachhutte, before the forest track back down to the village of Moos. A tremendous finale to your week awaits as you head by bus (payable locally) to the high-altitude Rifugio Auronzo at the foot of the world-famous Tre Cime di Lavaredo (2,999m at the top). These enormous freestanding limestone towers have been so popular with walkers that they've naturally become the symbol of the Dolomites. You follow a wide mountain trail constructed by soldiers during the First World War, which provides the finest perspective of these three immense columns. Dobbiaco is located at the entrance to the wild-romantic Fiscalina Valley, from where you can enjoy a fantastic view of the renowned 'Three Peaks'. The village is therefore also called the 'Community of the Three Peaks'. The facilities at the Hotel Bellevue are excellent and include a lovely spa with steam bath, sauna and indoor pool. Public rooms include an ancient wood-panelled stube (snug), a popular bar (where locals pop in) and a grand candlelit dining room. As guests of Headwater you will stay in a deluxe double room (subject to availability) with a balcony with stunning alpine views. Rooms have free wifi, hairdryers, satellite television, direct dial telephones, radio and safe. Room upgrades: Premium Double Room, Superior Double Room, Junior Suite Room or Suite. Transfers included from Venice Marco Polo airport at 12:05, and back to Venice Marco Polo airport at 08:15 (29th June return transfer at 11:00). Spectacular part of the world. Excellent walking with very accurate route notes. Hotel was perfect - great service and brilliant food every night, with a great choice of wines ( including local wines). We will definitely return as there are many more walks. We really enjoyed our self-guided walking holiday in the Dolomites because the possibilities each day were endless. With the hotel as our base and the excellent walking notes we were able to plan a varied programme. Having a bus/train pass and the timetables made planning easy. The local roads up to and above the tree line enabled days of walking amongst the peaks a real pleasure, with rugged, stunning mountain landscapes all around. The footpaths were almost empty and the peace of sitting in a high altitude meadow hearing only the birds and distant cow bells was truly relaxing. In the evenings we enjoyed the company of other self-guided holiday makers. The food at the hotel was excellent and the accommodation excellent. We would wholeheartedly recommend this holiday. Everything we had hoped for. The selection of location, hotel, routes were all spot on. This was our first hiking holiday with Headwater and we thoroughly enjoyed the whole experience. Despite the changing weather, we were able to choose a suitable hike for each day because of the range of hiking notes supplied by Headwater. The Park Hotel Bellevue was excellent - friendly and helpful staff, comfortable rooms, convenient location (especially for trains and buses) and amazing food. We paired this holiday with a cycling trip (Dolomites to Lake Garda), which started in the adjacent town. This gave us an extra day of hiking as our transfer between hotels took about 10 minutes by taxi. We would highly recommend this holiday. Excellent holiday. Stunning scenery and great walks. Every day seemed to offer something different. Challenging at times but nothing over and above the ratings provided. Excellent, detailed and easy to follow route instructions. A brilliant service. Absolutely stunning. The fine detail of choosing the hotels is excellent. Your website is easy to navigate and find fine details of holidays on offer. I would throughly my reccoment Headwater to anyone wanting a specialist holiday. Headwater were very accommodating to us, helping us to arrange our walking holiday to slot in between our plans to visit other areas in the same country during an extended stay. It was all very easy and everything worked very well. The hotel was lovely and in a great location. Our holiday was well organised and we had a very enjoyable time. The Dolomites are a spectacular walking destination and there are a range of different walks on offer. The notes for each are extremely detailed and all information os provided, even down to exactly which bus to take and where to get off. The descriptions en-route are very detailed and the local signage is great. The scenery is superb and the range of walks is excellent - I would definitely recommend this self-guided trip with Headwater to anyone wishing to walk in the Dolomites. Gondolas are an additional cost. Returning to the Parkhotel Bellevue every day is a treat. This family run hotel provides extremely attentive service, the food is quite simply delicious! And relaxing in the spa helps ease those tired muscles or sore feet. If you are thinking of the Dolomites then I would definitely recommend this trip and this hotel. Headwater were extremely helpful in planning our itinerary given we were travelling from different locations and adding on our own independent stay in Italy. It was no hassle to consider the different flight options available to us. All information communicated was detailed, relevant and reliable. Headwater are extremely competent and professional and put together great itineraries. Very well organised with comprehensive walking guides and maps, more walking options than days which was good, walking guides may benefit from a diagrammatic form of ascent and descent. I thought the hotel was excellent and Dobbiaco was a good base for exploring the north eastern Dolomites. The walks were interesting and well-described. The best walks required public transport which I found to be convenient and reliable though sometimes crowded. Our visit visit to the Dolomites, it won't be our last. Lovely area and first class support all round. An excellent holiday with all the arrangements working like clockwork. The notes for walks were very well prepared. We had a most enjoyable time. It was extremely hard to find fault with anything. Hotel, walks, routes just fantastic. Fabulous holiday in a perfect location. Great experiences that add to your life whilst there and cultural influences to enhance your life when you return home. We have always left wanting more, but not necessarily the same. Good - we had a great time, the weather was good in the latter part of the week. We enjoyed Verona and the walking around Dobbiaco. Dobbiaco is a very good centre to walk out from, with good bus links to different starting points. The Bellevue Hotel is super. This is the second time we have stayed there and we were not disappointed. The one down side is the return via Venice Marco Polo. Once the check in is open ( there was no baggage drop) it is just a procession from one queue to the next. Some lovely walking in spectacular mountain scenery, staying in a very comfortable hotel full of character. Some walks (and buses) were very busy even at the end of the summer season. Walking notes were excellent (the one exception was on the NemesAlp walk return to Moos where a new (?) ski lift was not mentioned - this caused some confusion to us and others. Thank you for taking the time to complete your post-holiday questionnaire. It was great to see you enjoyed the walks and the spectacular mountain scenery. We would also like to thank you for highlighting the route note discrepancy; we have updated the notes to include the new ski lift, thank you for pointing this out. We are sorry for the confusion this caused you. In closing, we would like to thank you for travelling with Headwater and look forward to welcoming you on another of our holidays in the future. This was an excellent holiday - just like our previous 3 Headwater holidays. The staff at the Bellevue were friendly and helpful and the meals were of a very high standard. As well as having a mountain view our room also overlooked the railway but this was not an issue, the trains were very quiet and we were not disturbed by them. The walks were varied and the scenery was outstanding- some stunning 360 degree panaromas and some delightful meadows and pastures complete with some very gentle cattle and their melodic bells. We could easily have spent a few more days here, there was at least one walk we did not have time to do. We took this holiday in late July and we were grateful that we had packed several layers, we needed them as we climbed up to the views and on a couple occassions I regretted not having brought my gloves! Our previous Headwater holidays have been rated as 2 boot and we can see why this holiday was rated as a 2+ boot, however the extra effort was well worth it as the views were exceptional. Toblach was a pleasant little town and a great location base for walking in those spectacular Dolomites. Hotel Belvue fitted the bill well, with charming , helpful management and staff - though they occasionally seemed a little overstretched at mealtimes; but this is a minor quibble. our 3rd floor room (a suite with balcony and a view up the valley) was excellent. i would go again. Wonderful walking week (despite the weather on some days!) in a fabulous part of the world. An excellent area for a walking holiday. Superb scenery with a well situated hotel. Food is first class. Our holiday in the Italian Dolomites was amazing. The hotel accommodation and food were absolutely excellent and the staff helpful and friendly. The walking notes were very accurate and comprehensive and it was very helpful to receive them ahead of time. We found some of the walks challenging but it was very very hot when we were there. Good excuse for a long cold beer when we got back to the hotel though ........... :-) The hotel has a lovely spa but unfortunately we didn't have the time to partake of the facilities. Fantastic walking in magnificent scenery. Excellent hotel. We really enjoyed the holiday, the scenery was amazing. Our hotel the Bellevue was comfortablle and clean, the staff friendly and helpful but not a lot to do on an evening, we sought out a couple of places in the town towards the end of the week but as we were on holiday right at the end of the season it was very quiet. The menu choice didn't have a great deal of variety/choice and did forgo the evening meal on some nights or went out beforehand as we has walked all day and we're quite hungry! (We are slightly buillt but did feel on some nights that we were stilll hungry). The spa in the hotel was lovely and we did use the pool and steam rooms but only on one evening when we returned early enough to use the facilities before dinner. The walking guides and maps were very helpful an on the whole accurate, some of the gradings for the difficulty of the walkes were not accurate some walkes described as Two boots had long or steep inclines and descents on rough ground and I did feel a little mis guided on one or two occasions but the views from the top soon made you forget asbout the effort it had taken. The arrangements made at our request worked really well and the flights and transfers were efficient and convenient. A lovely holiday just a little too quiet on an evening. Our holiday experience was fantastic! We loved walking in the mountains and hearing the sound of cow bells everywhere we went. It was easy to get around on the buses and trains, and the mountain trails were varied and interesting. The lakes were a beautiful colour, and the scenery was stunning wherever we went. The food in the hotel was outstanding, with a 5 course dinner offered on each night of our stay. The hotel's spa facilities were also excellent. I had anticipated a busy hotel with lots of Headwater customers, but apart from me and my friend there were only a few other hotel guests. This meant that the dining room was very quiet and lacked a bit of atmosphere, but the staff were very attentive and looked after us really well. I would definitely recommend the Dolomites to anyone who loves to walk amongst stunning scenery. The most popular trails are obviously busy with other visitors, but it is easy to find quiet routes and paths as there are so many walks to choose from. The scenery at the destination was absolutely spectacular and will remain in our minds for a very long time - starting with the view from our hotel room! An absolute must holiday for anyone who likes to have just the right amount of exhaustion, excitement and adrenalin in one day, with the facilities to relax and recoup overnight at the hotel, ready to do it all again the next day! Dobbiaco was a super location as a base for walking. The walks were well detailed and accurate and the views during the walks were quite stunning. Superb holiday that we thoroughly enjoyed! It rained quite a bit - but don't let that put you off. The scenery is marvellous; out of this world in some places - especially the Dolomites with their marvellously jagged mountains and stunning turquoise lakes. The Drei Zimmen/Tre Cime trail is magnificent and certainly worth saving to last! The hotel accommodation was truly superb with a leisurely 5-course meal routinely included. Too good for us, I have to say! Not many British families in this area. Keep it quiet... do they know what they are missing? Generally, very enjoyable - superb part of the world to explore; ideal time of year (our trip was not peak season); great to burn some calories during the day, then enjoy some fine food and drink in the evening; good mix of like-minded people. The quality and variety of walking was stimulating and typified the beauty of the area. I travelled in early July and the flower meadows were among the most abundant I have seen in Europe. The hotel offered well cooked and interesting menus (excellent pasta) and a good accompanying wine list, with friendly, helpful staff. Wonderful high level walking with dramatic views and an amazing variety of wild flowers during the day, and a very comfortable hotel with superb food in the evening. The walk notes were very good, although some local information with them would have improved the experience. There was 1 mistake we found for the Strudelkopf walk where after leaving the Hotel Hohe Gaisl you reach a stream '...after just 350m' should read '...after just 35m'. This caused confusion as the official path has been diverted - correct per the notes (but the old one/route being shown on the map) and the old one/junction is 350m from this point!! If you want a very fine single-centre walking holiday in stunning mountain scenery then Headwater's Dolomites experience in the Southern Tyrol is perfect: varied, stimulating, hard work and very satisfying. As well as the glory of the mountains, the flower-strewn alpine pastures are a botanist's heaven. Superb - staff & food at Hotel unsurpassable. Italian Maps not up to OS Standard (no surprise there!). You should have noted the new (2014) skilift available to take walkers down from Klammbachhutte (or a 20 min walk from Klammbachhutte) saving 4km of descent out of 5.6km. Headwater Holidays always provide excellent care and services, and value for money vacaions is well chosen resorts and hotels. The only thing left to chance is the weather. Excellent with wide range of walks accurately described and graded. Very good hotel with delicious food and very helpful staff. It was the first time for us with Headwater so we were slightly apprehensive but everything was excellent but mostly the choice of hotel. We are now looking forward to our next Headwater holiday to Gozo which is already booked. We usually travel independently but found that Headwater offered a hotel package more cheaply than we could buy ourselves and there was the additional benefit of the route notes which were excellent. My husband is the navigator of our team, but having tried Headwater, if I ever needed to travel on my own, I would be confident about using their notes and routes which were exceptional. We went to the Dolomites and had superb weather which made for a stunning holiday with plenty of walks to choose from. I would certainly use Headwater again. Excellent except for Marco Polo, slightly long transfer. The area was beautiful walking very good for all abilities. The Park Bellevue hotel was an excellent walking and cycling base in terms of its location, the options available and the standard and service of the hotel and its team. The local bus and rail transport and connections were frequent and very reliable and the provided Mobil card was fully utilised. The walks suggested in the holiday pack provided ample options for all abilities and the enclosed maps coupled with the standard of signing in the Dolomites showed there was much more to try if needed. A great holiday, helped by wall to wall sunshine for the first 4 days! Excellent holiday; fantastic hotel - which would it seems would be hard to book into directly (unless doing so a couple of years ahead). Used Headwater 3 times now which I would not have done if I did not regard them as a good company. Having taken 6 walking holidays through yourselves and Inntravel in the French Alps, Swiss Alps, Pyrenees and Dolomites, this holiday is the favourite of them all for both my wife and I. This was a new region for us which offered a good variety of terrain and landscapes. The unexpectedness and beauty revealed as each walk progressed made this a gem of a holiday. Would definitely recommend whole heartedly. An excellent holiday that exceeded our expectations in a fabulous mountainous environment. Accommodation was superb. Hotel staff excellent. Train noise bad in rooms. This is an excellent hikers holiday with well described routes and terrific scenery. On return the hotel and its chef is first class in providing the ideal evening. y nights we were disturbed. In Toblach there were open air rock music festivals opposite the hotel on the first two nights and on the third night the railway company decided to carry out maintenance till 5am outside our room. We also had two days of gunfire from the nearby military firing range. The hotel room and service/food were,however, excellent. Our room in Venice was situated overlooking the alleyway leading to the hotel. This was full of people all night and we did not get much sleep. The room itself was very comfortable and the staff very helpful. Very good indeed. Great location; walks sufficiently (but not too) challenging. Great food. Sometimes bus service arrangements to walk start end points a bit fiddly (we were put off from one of them by this). Easyjet baggage drop and general service at Venice airport (as distinct from the flights themselves which were fine) very poor. Excellent walking area with a wide variety of routes. We made great use of the local travel card included in our holiday which allowed us unlimited travel on both buses and trains anywhere throughout the Bolzano province. Marvellous scenery, excellent hotel, notes and route signing very good. Excellent location and region for walking. Maps and route notes provided were really useful and accurate. Hotel was comfortable and clean with excellent food and a good wellness area which was not used at all by other guests at the time we were there. This was a bonus for us. As we were early in the season, suggested walks were not crowded but we are sure at peak times things could be different. Overall we had a great holiday and will use Headwater again for another similar trip. The Dolomites are stunning and the walking was varied and challenging. The route notes were excellent and the self guiding was easy. The hotel was exceptional, with delicious food. The village of Dobbiacco was very well placed with good bus connections which made walking in different areas easy and enjoyable. Excellent location for seeing the Dolomites. This is an excellent place for a single centre holiday, offering many good trails with stunning views if you have good weather, but bear in mind that the conditions in high mountain areas such as this can be unpredictable, even in summer. Excellent accomodation, food, walks and scenery. Should have been advised that the hotel is located next to the railway station and level crossing with trains passing through from from 5.30 am. Our upgraded room overlooked the railway station and crossing. No air conditioning in rooms meant we had to leave open the windows during the night and heard announcements, warning bells and the trains themselves every half hour. Dobbiaco is an excellent centre for a walking holiday with superb scenery and good choice of walks. Transfers were efficient, hotel very good and we enjoyed our first experience of a Headwater holiday very much. 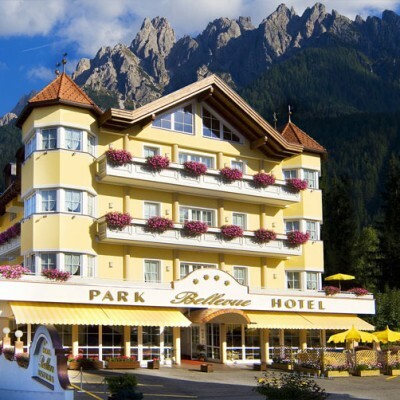 We thoroughly enjoyed walking in the Dolomites staying in Dobiacco/Toblach at Park Bellevue Hotel. The food was superb and beautifully presented and served. The hotel staff were extremely friendly and helpful.The hotel and swimming facilities etc were fantastic. We found the walks brilliant, did not expect to be walking in snow in June! but the notes on the whole were easy to follow, just got lost once and sometimes it took us longer due to snow and several fallen trees over the path on one walk. The bus ticket which was included could be used on the train and provided excellent value for exploring the region and the nearby towns. Best of all we met really interesting people in the hotel who had come with Headwater or Exodus and we all got on very well.Have already recommended Headwater to friends. Thoroughly enjoyable from start to finish, directions for walks / routes easy to understand and very accurate, excellent mix of walking companions in our group, superb location and scenery, the week went too fast! Fantastic combination of great scenery, good walks, superb hotel made a wonderful holiday. Good range of walks in outstanding scenery.Surprising lack of facilities in Dobbiaco considering time of year e.g. Most shops closed- almost no bars or alternate restaurants! We had a super week with like-minded people. Although we were all initially wary of socialising as a group, during the week we became closer and enjoyed each other's company. The hotel was fun - comfortable and friendly with multi-course meals of excellent quality that were welcome after a day's hiking. It was the antithesis of an impersonal chain hotel. The only thing it lacked was wifi outside of the reception area. And some reference books - for example for wild flowers - would have been useful. The walks were spectacular, probably made more so by the fact that we were early in the season - mid June. Tre Cime and Mount Elmo were decidedly scary first thing in the morning before someone else had kicked foothills in the snow. We learned to catch the buses around 10am not 9am. The notes were not entirely accurate and read as if the walks had not been checked for some time. In fact it didn't matter as the local trails are well signposted. Every member of the group who did the Mount Elmo walk got lost and changed from the notes to the maps or signposts. The 'Churches and Chapels' walk was unexpectedly interesting and quite energetic despite being on quiet lanes (very quiet - we were passed by one car and two tractors in 4 hours). It was a good contrast to the other walks and well worth doing. We appreciated the notes on eating places - or the lack of them. It was useful to know when a packed lunch was necessary. The travel card was convenient. Buses ran regularly to the walk starting-points and were not crowded at this time of year. On one day we caught the train (next to the hotel) and explored Brunico. Every stop had something to look at (see the poster on the platform). A number of people went on to Venice afterwards, an easy trip given the minibus to the airport and then a bus to the station or a water bus to St Mark's Square. Park Hotel staff and service outstanding. The walking guide notes were a good way to get the feel of the available routes in an all too brief week..they were accurate and very detailed. The Locanda staff were a delight, as well..so cheery and helpful. The Ferrovia area is a bit of a nightmare people crush, but, amazingly, down our little alley, all was very peaceful. The small Trattoria next to the hotel was a nice place too..staffed by pleasant and hospitable couple. A delightful area with a large range of walks. The holiday was a wonderful experience with really beautiful views to reward us as we tackled the walks. Instructions and timings were excellent. The hotel was lovely too. Wonderful holiday excellent accomodation and walking. Some walks quite challenging but managable. One of the best food in any hotel I have stayed in. Good quality wine at reasonable prices. The holiday offers a good choice of walks for all levels and we weren't disappointed with any of them. The first two walks we undertook started from the hotel. A number of the walks start a bus ride away and we soon got into the swing of catching the bus and the drivers were always very helpful and patient. The hotel was really lovely and exceptionally friendly. We travelled by train and the hotel is very near to the train station. The views were truly excellent. All in all, a delightful holiday in the Dolomites. This was our fifth holiday with Headwater and our best to date. We are always happy with the holidays booked with Headwater and the support provided by your staff. The Dolomites is a superb location for a walking holiday and we wondered why we had never considered this holiday before - we will definitely be visiting again. We liked the fact that all of the walks were easily accessed by the local buses and cable cars or gondolas. The Bellevue Hotel provided a very high standard of accommodation and the food was fantastic. A good selection every day, beautifully prepared and presented. One of the friends we travelled with requires a gluten free diet, Headwater had advised the hotel in advance, and the hotel went out of its way to provide delicious gluten free rolls and adapted the menu accordingly so our friend felt she was well looked after. The hotel staff were always welcoming and helpful. A holiday that we will be considering re-booking as there are so many trails we still want to explore. We thoroughly enjoyed our Headwater holiday in the Dolomites. The walking directions were excellent (maps were redundant) and the walks themselves inspiring. Mid-August is probably not the best time to go - the weather was glorious, but really difficult to escape the crowds of people. We only had ourselves to blame! The staff at the Bellevue hotel were delightful (full marks to Rita and Andrea in the dining room - and to Andreas for his overall supervision) - but beware if you're in a room facing the railway tracks.....the early morning announcements of train arrivals / departures wore a bit thin by the end of the week. A wonderful region for walking at almost any level. Every area we walked was beautiful and we did a mixture of moderate (with a little bit of challenging) and leisurely. Hotel was excellent, very friendly and helpful and good food. All travel arrangements on the flights and the transfer to and from the hotel went well. 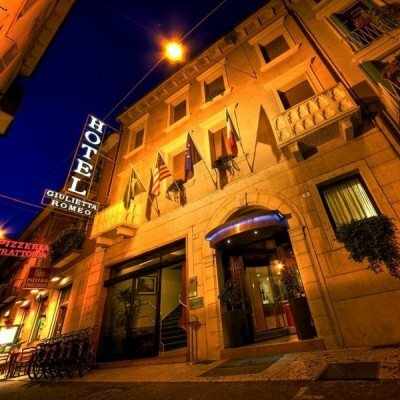 The food and accommodation at Park Hotel Belleview in Dobbiaco were very good and the staff were very helpful. We got on well with other Headwater clients through the week we stayed there. The weather in mid-June was warm with little rain. Due to a recent knee problem my wife and I were unable to walk on as many routes we would have liked to but the Tre Cime and Lago de Braies walks that we did manage to complete were stunning. The 7 day travel pass was a real bonus and one day we travelled to Villnoss by train and bus to take pictures of the view of the Odler mountain range from St Magdelena. We plan to return another year. A great venue except for the overcrowding on the buses. Very enjoyable, although the walking was quite challenging due to length, terrain and lingering snow. We often adapted / cut short from the recommended routes, but this was feasible and equally enjoyable. Fantastic scenery. A beautiful area of the Dolomites with spectacular scenery and added historical interest. An excellent choice of varied walks to suit all abilities. A very good hotel base, well situated. We had a very enjoyable but quite energetic holiday in a comfortable hotel in the Dolomites. The early season flowers and scenery were spectacular. Although I have indicated that we would book a holiday with you again I would have strong reservations as to whether the holidays that you provide are really catering for our interests. Before booking the holiday I raised the query as to whether or not it was suitable for us given that we walk to see wildlife and landscape rather than just to walk. Unfortunately the worry that the holiday was a walking holiday with little or no emphasis on wildlife came to fruition. At the start of the holiday in Dobbiaco we found it virtually impossible to find out information on where to go to get the best chance of seeing wildlife or to get information needed to identify the flowers that we were seeing. The hotel did not know nor did the tourist information centre. Half way through the holiday we managed to get to the nature centre at the Grand Hotel who were very helpful but by that time the opportunity to visit the areas suggested had largely passed. We also found the large numbers of walkers on the routes suggested to be offputting for us. We are used to walking in areas where you often do not see footprints let alone people so we were amazed to see so many people on all the routes that we followed. Perhaps it would be possible to include routes that are quieter for those that want to escape the crowds. Having said all that the holiday was well organised the hotels were excellent and if all you want is a walking holiday then I doubt that the service that you provide can be beaten. I am just not sure that it is for us. No minimum group size, however transfers are subject to at least 4 people (in total) booked on each departure. Saturdays from 8th Jun 2019 to 28th Sep 2019, for 7 nights. All dates are subject to availability, please contact us to check. Airport transfers are subject to at least 2 people (in total) booked on each departure. You should allow approx 35 Euro per person for cable car and chairlift usage not included in the Mobil card. Due to the tailor-made nature of our holidays, we need a little more information in order for us to check availability for Walks in The Italian Dolomites. Simply complete the form below and a member of our sales team will contact you (when it's most convenient for you) to provide availability information, travel options and an accurate price. Of course there's no obligation, but if you do wish to proceed with a booking they will be on-hand to assist you throughout the process.